Below are three AFF heroes who demonstrate how to max out the magic, combat and social skills in Advanced Fighting Fantasy. They are accompanied by my debut artwork*. Enjoy! Skills: Priest magic (11), Magic (10), Unarmed combat (9), Dodge (8), Minor magic (8), Etiquette (8), World lore (8), languages (8). Magic spells: Stamina (1), Tongue twister (1), Iron hand (1), Weakness (1), Befuddle (1), Counterspell (2), Summon (2). Priest spells: Silence (1), Holy command (1), Darkness (1). Minor spells: Attraction, Hold, Hold it!, Honesty, Inebriate, Instil, Mistake, Pucker, Repulsion, Smudge, Stutter. Equipment: Amulet of Hamaskis, spell book, holy book of Hamaskis, pouch full of small pieces of weapons, food, horse hair and other small pieces of miscellaneous equipment for use with the summon spell, bag of healing herbs, bandages and a small bottle of alcohol for healing. Background: Born in Blacksand, Branwynn had to fend for himself at a young age. He was enrolled into the Thieves' guild and took part in many nefarious activities. However, the turning point in Branwynn's life came after he broke into the tower of the wizard Brabantius. Curious, he started reading from a scroll and accidently summoned a demonspawn. Brabantius saved his life that night and, instead of killing Branwynn, he realised the potential in him and made him his apprentice. Branwynn had a knack for trickery and Brabantius taught him spells to disrupt the magic of other sorcerers. Branwynn almost died when a rival sorcerer tried to cast the death spell on Brabantius and Branwynn countered it. However, the exertion of countering the spell almost killed him as well as aging him by a year. Brabantius merely left him for dead. 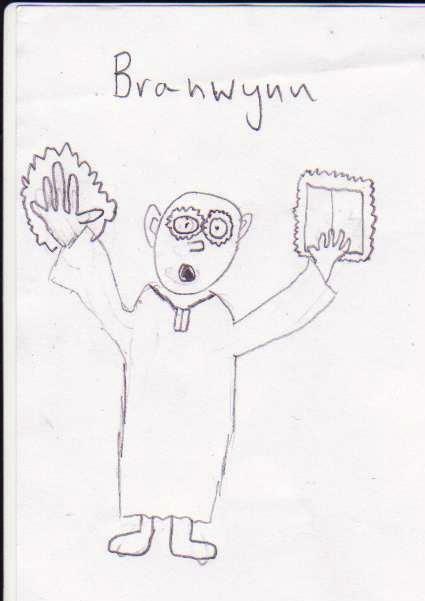 Feeling dejected, Branwynn left Blacksand and wandered aimlessly for a while, before being taken in by the monks of Hamaskis who recognised his skills and enrolled him in their order which hunts down evil sorcerers, those who abuse the gifts of Hamaskis. Personality: Branwynn is pleasant and polite but reserved. However, when there is a threat of evil sorcery, he springs into action. He prefers to fight unarmed, knowing that sorcerers can animate hand held weapons or turn arrows into snakes. He also tries to prevent sorcerers casting spells with silence, tongue twister and befuddle spells. He only uses counterspell as a last resort, knowing how draining it is. If he knows about the dangers he faces, he may summon up a useful item with his spell. He also makes sure that everyone in his team is as healthy as possible. He's the dude with muscles. Minor spells: Hold, Hold it!, Inebriate, Instil, Mistake, Push, Slip, Sober. 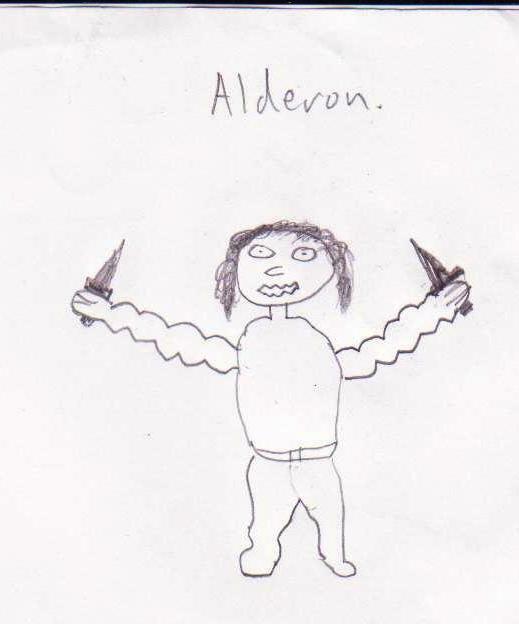 Background: Alderon was born into a family of mighty warriors from Salamonis and learnt his skills at a young age. He was bred and trained to be the perfect warrior. However, after a bad decision on a mission which led to some deaths, he took off and decided to be an adventurer. He never talks about that incident. Personality: Alderon's skill is only mached by his smug arrogance. Despite being difficult to work with, few people say this to his face. He skilfully wields two daggers simultaneously, favouring them over larger, heavier weapons. After all, with his strength, he still inflicts considerable damage on opponents. He also knows some minor magic to get him out of trouble. He once humiliated a rival warrior by making him drunk and then pushing him over with his minor magic. Not knowing that sorcery was involved, the onlookers just thought that his rival could not hold his drink. He's friendly but prepared if it turns nasty. Minor spells: Attraction, Enhance, Hear, Hold it!, Honesty, Inebriate, Instil, Mistake, Repulsion, Smudge, Sober, Stutter. 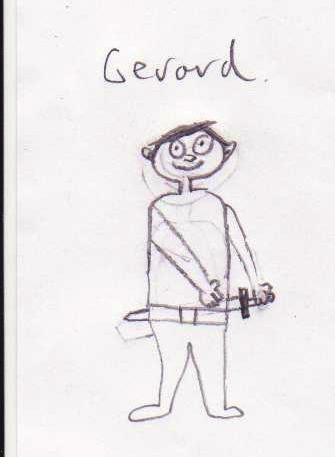 Background: Born into a merchant family in Salamonis, Gerard quickly showed his talent for buying low and selling high. However, his family and all they own were wiped out by an orc tribe, a disaster he narrowly missed due to an illness that left him bed bound for weeks. He sold his house and tried to start a new business. Gerard had some minor successes and showed his true mettle in starting a business from scratch. He has many contacts and allies amongst the merchants and mercenaries of Salamonis. Personality: Gerard is charming, forceful and persuasive. He can persuade almost anyone to do anything and is able to fit in with almost any society in terms of knowing how to dress, customs, language etc. He also seems to know everybody and can pull in favours for almost anything. He is a useful ally to have on a team. * I do not accept responsibility for any black holes that open up in your room due to the sheer lack of artistic talent in these drawings.